Addo Reach & Hein’s Cottage: Addo Reach & Hein’s Cottage is a cosy home away from home, fully equipped for self-catering, where you are guaranteed privacy and comfort. The cottage sleeps two in a double bedroom with twin beds, with an en-suite bathroom and shower. An extra small guest can be accommodated on a day bed in the lounge, at an additional cost of R75 per night a travel cot is available if you need one. A TV, CD player and DVD player is available but we regret, at this stage, with basic channels only. We offer private, secure parking, and the exclusive use of a braai area and patio. Daily servicing of the cottage is included and a laundry service is available, at extra cost. In the main house, we offer you a large bedroom with queen-size bed and full bathroom. Tea and coffee-making facilities and a fruit basket will welcome you. Our non-licensed home pub has a TV and you are welcome to join us there – but bring your own tipple. Ours is a non-smoking in the house establishment, but the garden is large. If you do not feel like cooking, meals are available a hearty breakfast at R55 per person and a 2-course dinner at R90 per person is offered, if you let us know on reservation. Braai packs, wood and bread can be russled up too. Louis’ Pub and Grub is open on Fridays and Saturdays with the best steaks and pizzas and splendid atmosphere. Alicedale is a small hamlet in the heart of 1820 Settler country. This is a safe, secure and malaria-free environment with superb game viewing opportunities. Addo Elephant Park and the Shamwari, Pumba and Scotia Parks, to name a few, are within easy driving distance, on excellent roads. The historic and picturesque towns of Grahamstown, Salem and Sidbury are also within easy driving distance and the renowned Grahamstown Festival in June and July of each year, with the cream of local and international arts, crafts and theatre is but 52 km away. You can choose to test your skill on the challenging 18-hole Gary Player Golf Course within walking distance of Hein’s Cottage, or take the opportunity to relax, sleep late, read, paint, cycle and just be peaceful. 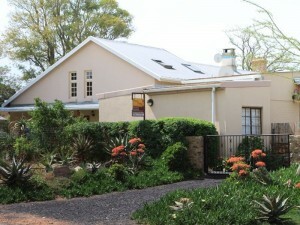 Please enquire from Addo Reach & Hein’s Cottage for further details. George McCall, South Africa: We enjoyed our stay very much. Good food and great company. We especially liked the ironed sheets! Susanne Psiuk, South Africa: One of the best accommodation I ever enjoyed in SA; very tasteful interiors, enough space and very clean. Friendly owner. All was perfect! Thank you! Andy Overbeek, South Africa: Eli, John and Gran are such nice, friendly people that, even if the cottage was a pondokkie, it would have been worth staying there. The cottage was in fact extremely comfortable and the service was excellent! While staying there, it is well worth it to visit the local pub, Louis’, for a drink or two and a delicious steak.